One World Currency And The SDR Bond – and does China’s joining it on October 1st have a connection to the Shemitah? it would appear they have timed it to the Sh’mita! I have also noticed that my flight tickets in the fine IATA print at the bottom of the printed receipts has included the SDR value for several years at least. “Special consideration should be given to giving the SDR a greater role. The SDR has the features and potential to act as a super-sovereign reserve currency,” wrote Zhou in 2009. He also wanted the yuan to be included in the SDR, which is going to happen on Oct. 1. Take heed of his predictions. And in receiving it, I realised I knew next to nought about the SDR and what it represented, but my alarm bells went off. SDR value on airline tickets? China joining the SDR on October 1st? Que? But isn’t the Internet wonderful? The SDR was created by the IMF in 1969 as a supplementary international reserve asset, in the context of the Bretton Woods fixed exchange rate system. A country participating in this system needed official reserves—government or central bank holdings of gold and widely accepted foreign currencies—that could be used to purchase its domestic currency in foreign exchange markets, as required to maintain its exchange rate. But the international supply of two key reserve assets—gold and the U.S. dollar—proved inadequate for supporting the expansion of world trade and financial flows that was taking place. Therefore, the international community decided to create a new international reserve asset under the auspices of the IMF. Only a few years after the creation of the SDR, the Bretton Woods system collapsed and the major currencies shifted to floating exchange rate regimes. Subsequently, the growth in international capital markets facilitated borrowing by creditworthy governments and many countries accumulated significant amounts of international reserves. These developments lessened the reliance on the SDR as a global reserve asset. However, more recently, the 2009 SDR allocations totaling SDR 182.6 billion played a critical role in providing liquidity to the global economic system and supplementing member countries’ official reserves amid the global financial crisis. Sounds innocent enough. The birth of a new reserve currency alongside gold (yep, still around) and the USD. And the Chinese are being allowed to come to the party (as I understand it, at the expense of the level of the Euro’s participation, not the USD or anyone else – an interesting phenomenon in itself). We have also previously discussed the use of IMF Substitution Accounts to facilitate the issuance of SDR bonds and act as a tool to diversify and substitute USD denominated foreign exchange reserves with SDR bonds. This will likely be a major component of the G20 report on broadening the use of the SDR. To make all of this work, banking and finance must accept and adopt the SDR as a unit of account. Financial instruments, or intermediaries, need to be further developed and implemented in order for this concept to gain ground as a viable partial-solution to the problem of contracting growth. A framework needs to be created where SDR liabilities can be matched against SDR deposits. This would entail a greater private use of SDR as a unit of account and lead to its enhanced role as a reserve asset in the international monetary system. … The size of the World Bank’s new issuance program is 2 billion SDRs (approximately equivalent to USD 2.8 billion). The bonds will be denominated in SDRs and payable in Chinese renminbi (RMB). The precise timing of issue and individual bond terms will be based on market conditions at the time of issuance. It seems this whole situation is moving much faster than anyone could have predicted. With this new SDR being planned since the 1970’s it seems they have been working on this for quite some time. There was another important development in the 1970’s, August 1971 to be precise – President Nixon closed the gold window. Seems there was a little more to that step being taken than meets the eye. … As the new M-SDR Bond, as we stated, begins to mature it will be in demand, not only from large investors – nations, large banks and hedge funds – but will become more attractive to retail investors. This is where the change will occur and the SDR will move from a bond to a currency. If you listened to the interview conducted with Larry White I describe a very specific scenario that moves the M-SDR from a bond to “acting like a currency”. As this aspect of the M-SDR bond grows it will be very easy for the citizens to accept this as a currency. The citizens already accept a “blip-on-the-screen” as currency why wouldn’t they accept a different form of illusion – what is the difference? Certainly, Rory Hall sees this rapidly becoming the single global currency long spoken of. Worth Wray, the chief global macro strategist of STA Wealth Management, agrees: “Right now there is no organic demand, but over a five-year horizon it could develop globally and maybe that creates another channel for capital to flow into China—if that’s the only market there is for it,” he said in an interview. The SDR bonds issued by the two official institutions are different from the official SDR issued by the IMF. In fact, they are a derivative of it. When the World Bank unit called International Bank for Reconstruction and Development (IBRD) issues the bonds, it receives payment in yuan from the Chinese market or at first from the issue’s underwriter, the Industrial and Commercial Bank of China. It can then proceed to either spend the yuan in China or exchange them for other currencies and spend them abroad. So far, the IBRD has disbursed $46 billion worth of loans, grants, and credits in China. It is important to note that this process is effectively creating SDRs, which have previously not existed. Chinese investors receive the SDR bonds, but what do they actually own? For the Chinese investors, there is the advantage that they can hold a sizeable non-yuan denominated asset in China and reduce their risk to the Chinese currency. Official SDRs can be redeemed for dollars, euros, yen, pounds, and soon yuan through the IMF. However, the new private SDR, or M-SDR as the IMF calls it, cannot. The new bonds represent a claim on the IBRD. Since the IBRD doesn’t have any SDR assets, the repayment will also be in yuan, dollars, euros, yen, or pounds. So what’s the point of having this new basket? For the IBRD, there is no advantage because it is borrowing in strong currencies and getting paid in a relatively weak one. For the Chinese investors, there is the advantage that they can hold a sizeable non-yuan denominated asset in China and reduce their risk to the Chinese currency, which may further fall in value. Because of still-existing capital controls, buying foreign assets in size is not yet possible on the Chinese domestic bond market. However, this is only an advantage for the time being. At the point of maturity, foreign currency will have to flow from the IBRD to the Chinese bond holders, unless they choose repayment in yuan, in which case the whole exercise would be rather pointless. So given this lackluster value proposition, why are China, the IMF, and the U.S.-controlled World Bank going out of their way to push the SDR into private markets? Prominent market observers like James Rickards and Willem Middelkoop have long argued that the SDR will be the next world reserve currency. In fact, the current governor of the PBOC, Zhou Xiaochuan, has advocated for the SDR to become the next global reserve currency for a long time now. It’s a geeky name but it’s a kind of world money printed by the IMF. They’ll flood the world with trillions of SDRs. “The Chinese … have made it very clear that the Special Drawing Rights of the IMF is the preferred future international world reserve currency,” Middelkoop wrote in a note to clients. “What you are going to see is world money. You are going to see the IMF print Special Drawing Rights (SDR). It’s a geeky name but it’s a kind of world money printed by the IMF. They’ll flood the world with trillions of SDRs,” Rickards told the Epoch Times earlier this year. Now that the first issuance is well underway, it is easy to lever up the balance sheets of international development organizations and keep issuing—or printing—SDR obligations even in the trillions until even private market actors support and accept them. Once the SDR is widely accepted as payment, the IMF could just redeem all outstanding local currencies for SDR and the world would not only have a new reserve currency, but just one global currency. “You create new liquidity. That’s the kind of reform that could change the international system immediately,” says Worth Wray. Willem Middelkoop says this could be done through an IMF substitution fund, an idea already discussed in the 1970s. “This fund could facilitate a direct exchange of dollars for SDRs. The liquidity issue would be resolved with one stroke of the pen, as an SDR would be created for every dollar that was exchanged,” he wrote in his note. Sounds crazy? It is, but the official plan is right here, for everyone to see. So, some certainly the see SDR or, more accurately, the M-SDR Bond becoming the new global currency. And the timing for all of this fits. 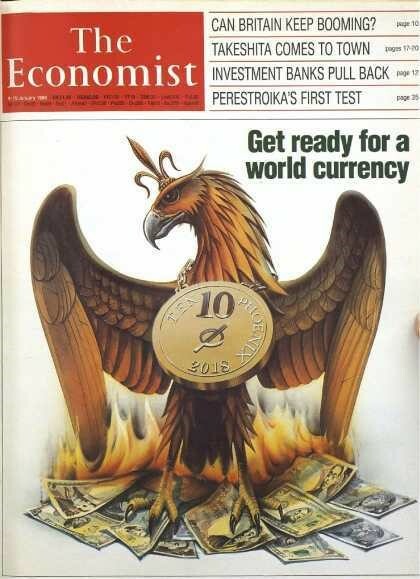 This 1998 cover of The Economist – a recognised Rothschild mouthpiece – forecasts a new global currency in 2018. Remember, these horrific people seem bound in some way to reveal their plans ahead of time. Which seems a natural segue to the Shemitah, given this shows the phoenix global currency arising from the ashes of the US dollar. I have written about the Shemitah phenomenon before, initially regarding the 7 year cyclical pattern that completed last year, and then this year, given it is what is known as a Jubilee Year. But I was interested to understand this phenomenon in more detail, so I read Jonathan Cahn’s The Mystery of the Shemitah. Jonathan Cahn is a pastor and a Messianic Jewish self-professed Rabbi best known for his best-selling novel The Harbinger, in which he compares the United States and the September 11 attacks to ancient Israel and the destruction of the Kingdom of Israel. In particular, he sees Isaiah 9:10 as a prophetic warning to the United States. “At the end of every seven years” refers to the last day of the Sabbath year. Elul was the last month of the Hebrew civil year, and the twenty-ninth day was the last day of Elul. So on Elul 29, the very last day of the Sabbath year, a sweeping transformation took place in the nation’s financial realm. Everyone who owed a debt was released. And every creditor had to release the debt owed. So on Elul 29 all credit was erased and all debt was wiped away. The nation’s financial accounts were, in effect, wiped clean. It was Israel’s day of financial nullification and remission. In the Hebrew reckoning of time, each day begins not with the morning but with the night. This goes back to Genesis 1, when the account of Creation records that there was first darkness, night, and then the day. So every Hebrew day begins with the night before the day. And since night begins with sunset, every Hebrew day begins at sunset. Therefore the moment that all debts had to be reckoned as wiped away was the sunset of Elul 29. Cahn then suggests this ancient Jewish pattern of biblical times is simply manifesting itself in our time. There’s no doubt it is, but when he attributes it to the re-expression of biblical prophecy that sees America as the “new Jerusalem”, paying for its sins in the same way, that’s where we part company. If he attributed the pattern to the plans of the satanic Jewish global elite who run our world setting up this old Jewish pattern, then we might strike some agreement, because that, in my opinion, is what sits behind the current pattern. And it’s important to remember that any reset discussed would only apply to the Jews between themselves. The goyim, as per the Talmud, are worse than cattle, put on the Earth to serve the Jews. So, is Cahn naïve or complicit? I’ve drawn my own conclusions. I’ll let you draw yours. So, the 7 year cycle of the Shemitah completed last year. Why is it in play this year, 2016? It turns out that after 7 rounds of 7 years (49), the following year (50th) is a reset of far greater magnitude. 2016 is a Jubilee year. And so, when is Elul 29 in 2016? October 2nd. A Sunday. Is China joining the SDR basket on October 1st a coincidence? Not in my reckoning. And, more broadly, is this the time when the stockmarket house of cards will be allowed to seek its real value?